Slider 2 Repeat Rhythm Value (Please check this description - thanks!) 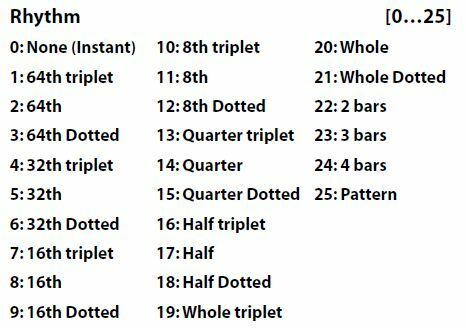 Sets the rhythm (repeat time) for each repeated note (16th note, dotted 16th, etc.) from one of 26 settings (see image below). Rhythms chosen here lock to the Global Tempo, or to the Tempo Envelope. This slider is often also connected to Rhythm: Template + Restore.